My classroom got some new pets this year. 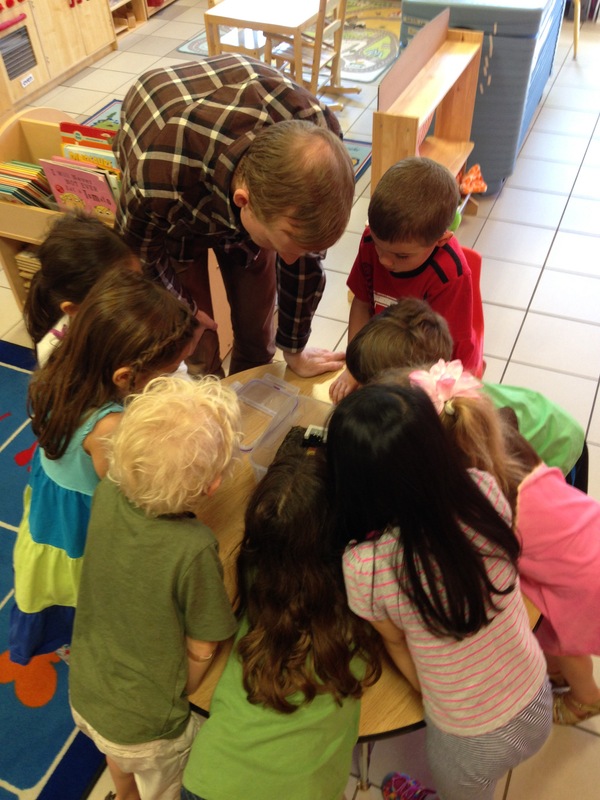 We adopted a group of harvester ants, which gave me the opportunity to teach an extended lesson in scientific experimentation. Science lessons for young children typically emphasize observation and investigation. That’s a major component of my approach, but I also run experiments with my students on a regular basis. Ants turned out to be great subjects for us to study. I took some time to read about what others had done, and I looked at some products that are available. 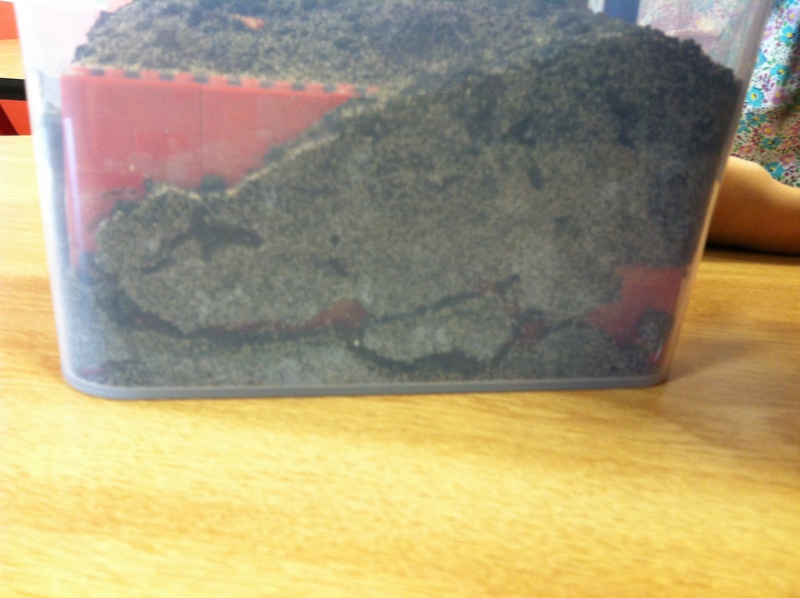 The first challenge was finding a home for the ants. There are many ant farms available for purchase. Most, if not all, are tall and narrow–designed to demonstrate how ants dig their tunnels. 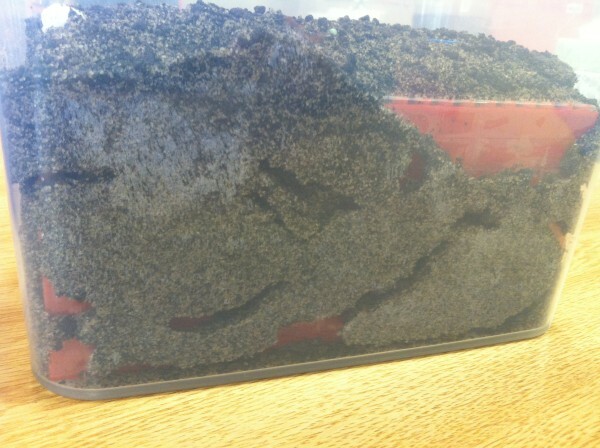 I did want my students to see the ants tunneling, but I also wanted a flat surface on which we could set up experiments. I decided to buy an 8″ by 6″ rectangular plastic food storage container. However, there’s a problem with having a wide container. 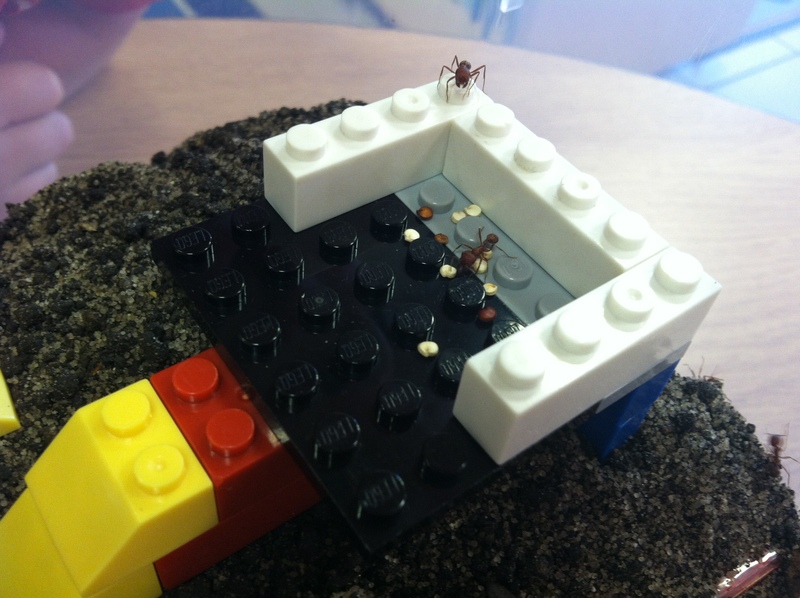 The ants will dig down to center and out of sight if they can. I needed something to keep the ants from digging anywhere but at the edges of the container, where we could see their tunnels. 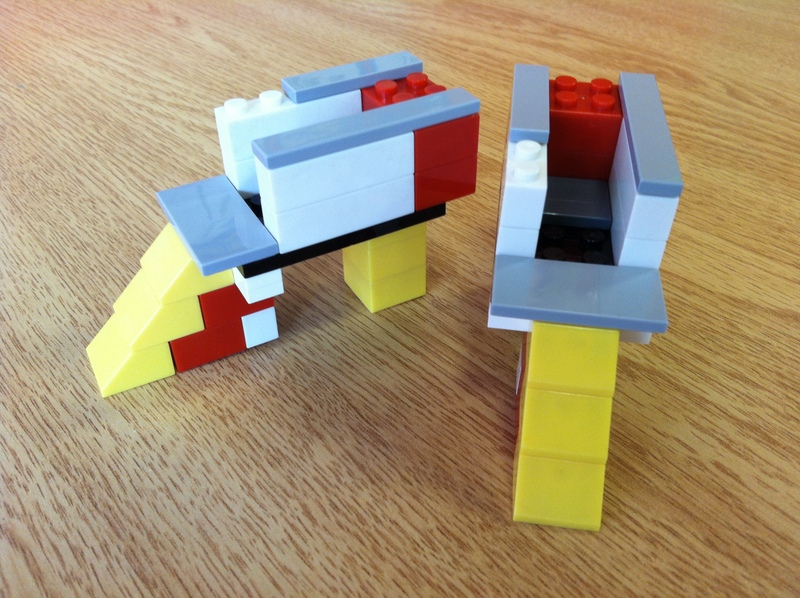 I couldn’t find anything that was quite right, so I did what any of my wonderfully resourceful students would have done; I built something out of Legos. Next, I needed to get some dirt. 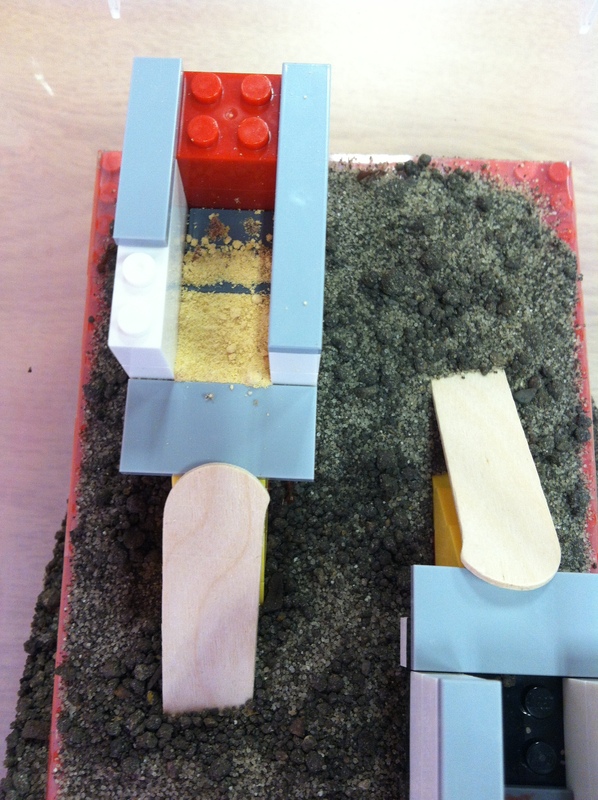 I had read that a mixture of dirt and sand works well. I pulled some dirt out of the local garden, mixed it with sand, and then filled my container. Unfortunately, my dirt mixture turned out to be a minor failure. Our ants had a hard time keeping their tunnels from collapsing. We witnessed a few fascinating ant rescue operations. (Tip: don’t try to help; you’ll only make it worse.) The children were pretty empathetic towards those trapped ants, which in retrospect I realized might have been a valuable experience. Perhaps that empathy generalized to some other creatures… or classmates! As for the soil, I don’t know what would have worked better, but I used the opportunity to discuss with my students what we might want to do differently next time. Science doesn’t need to be perfect. (Nor do teachers!) It’s always worth the time to model working through challenges and setbacks and to practice doing so with children as partners. Then came the key component: ants. I considered getting some from the ground outside. It would be a fun experience finding them as a group. Unfortunately, our school is in the heart of the concrete jungle. Our playground is indoors, as the nearest park is far away. Another challenge would be finding the right kind of ants. I worried that I would end up with escapist ants, nasty biters, or both. Feeling that there were already enough question marks surrounding the project, I decided to purchase red harvester ants from here. They are capable of painful biting, but they are bad climbers, incapable of crawling up the wall of my container. They’re also very active tunnelers. They were delivered ahead of schedule, so I kept them in the refrigerator for an extra day. When I released them, all but a few gradually awoke. Finally, I had to come up with a way to keep my ants in the dark and hydrated. I was preventing them from digging down into dark places, as is their instinct, so I kept them covered with a dark blanket for most of the day. I also read that providing ants with a source of water was important, but that pools of water were likely to drown them. 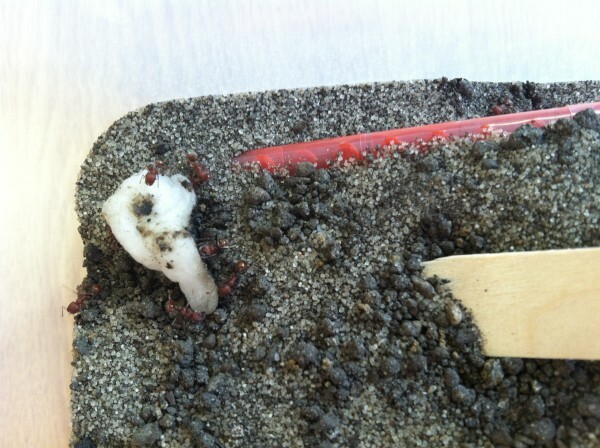 So we placed small pieces of wet cotton balls in the container with the ants. 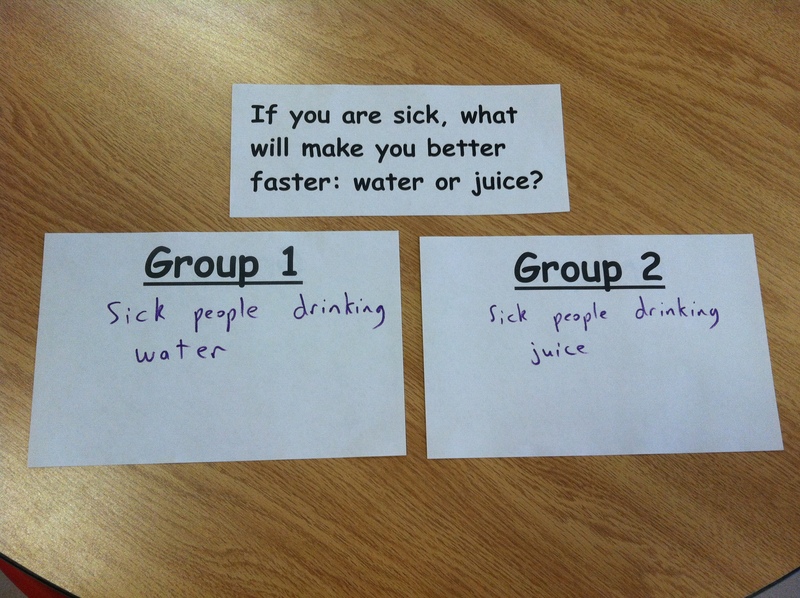 Then we started setting up simple experiments. I used Legos again to make little feeders that we could put different foods on. I put food on the feeders and carefully placed them on the flat surface in the middle of the container. We wanted to see which foods the ants would prefer. Over the course of weeks, we tried comparing many foods: strawberries, quinoa, corn meal, barley, blueberries, graham crackers, chia seeds, pineapple, garlic, rice, and more. With some combinations, it was difficult to determine whether there was a preference. Other times, it seemed clear what the ants preferred. Strawberries always drew a crowd of ants. Tiny pieces of blueberries and graham cracker crumbs were carried off quickly. Quinoa was perhaps our favorite to watch; because of its light color, it was easy to see when and where the ants carried it. In another experiment, we set out to test whether ants will avoid cinnamon. I built taller feeders that forced the ants to cross over a small indentation. In that space, one feeder had nothing, while the other was filled with cinnamon powder. We left quinoa and blueberry pieces on both feeders beyond the indentation. The results were clear. We watched the ants crawling in and out of the feeder without cinnamon, and all of its food was gone within days. In contrast, the feeder with cinnamon seemed to be untouched; even after a week, all of its food remained in place. This particular experiment was rewarding for me as a teacher. 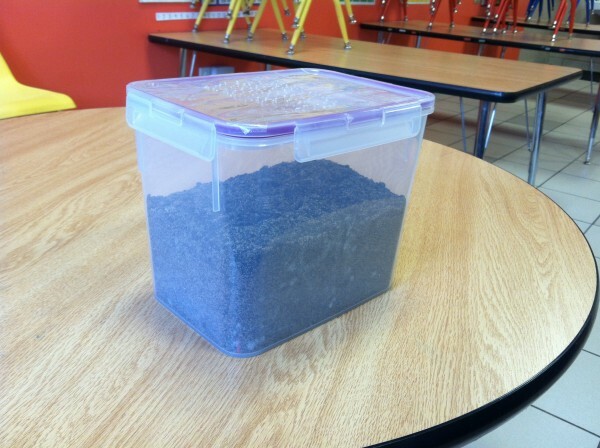 Things seemed to click; the kids really seemed to understand how this experiment helped us learn about our ants. With earlier experiments, I often asked somewhat leading questions to help the children understand what the experiments had taught us. 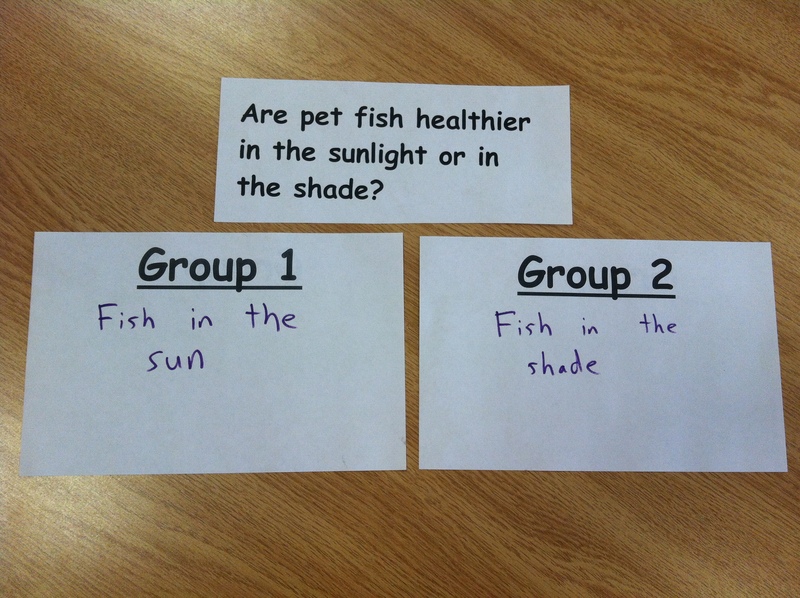 This time, all I had to say was, “What do you think?” and the kids did the deductive reasoning on their own. In preparation for another experiment, we talked about why the ants didn’t cross the cinnamon. Perhaps it was the odor, or perhaps it was the way it feels. I suggested that maybe ants don’t like walking on any kind of powder. So, we tried the exact same experiment but with ginger powder. This time, the food disappeared from both feeders. In fact, the ants seemed to have done some digging in the ginger powder. After a month or so of experimenting, I began to wonder about some ant behaviors. It was often hard to tell what the ants were doing. We had to do a lot of guessing. One question in particular I wanted to investigate. Most of the foods that we left out were carried to one or two corners of the container. The ants seemed to be storing it, but we weren’t sure. Perhaps ants like to carry things around and pile them up. Perhaps some, if not many, of the foods that were carried off of our feeders weren’t actually eaten. 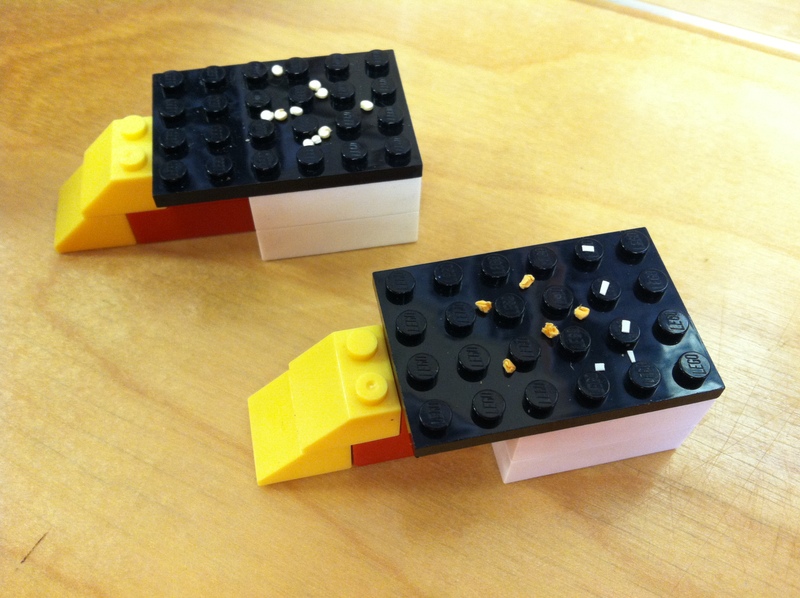 To test these possibilities, I set up two new feeders: one with quinoa, one with tiny pieces of orange paper and white plastic. To our surprise, the ants carried everything away, calling into question the validity of our previous food comparison experiments. We may have been testing a preference for what ants like to carry, not a preference for what ants like to eat. However, if I could start over, I may not do things differently. I had hoped to demonstrate the many ways scientists tinker with their experiments and question their assumptions. Finding a big problem with the validity of our previous experiments gave us a chance to talk about the ways science can stumble in its slow journey toward new knowledge. As a whole, the project was a little crude, but fairly scientific, too. I think it did a lot to help give my young students a good early foundational understanding of how science works. Every summer, my class spends two weeks delving into the world of science. Science lessons pervade my classroom year round, but in these two weeks we dig deeper into what it really means to be a scientist. Make a test or an experiment. What did we learn? Should we do another test? Then we practice it many times. Each day, I ask a few scientific questions. Everybody makes their hypotheses. I point out that scientists often think different things, and they often need to change their minds. Then I point to step number 2 and ask, “Are we done? Is that how science works?” and the class energetically point out that we have to make a test, or an experiment, or it won’t be science! What’s healthier for cows to eat: grass or corn? Does algae grow faster in salt water or fresh water? Does eating lots of vegetables make people healthier? What kinds of shoes are faster for running: sneakers or sandals? Do plants need water to grow? Do balloons lose their air faster when it’s hot or when it’s cold? Does boiling water kill the germs in it? 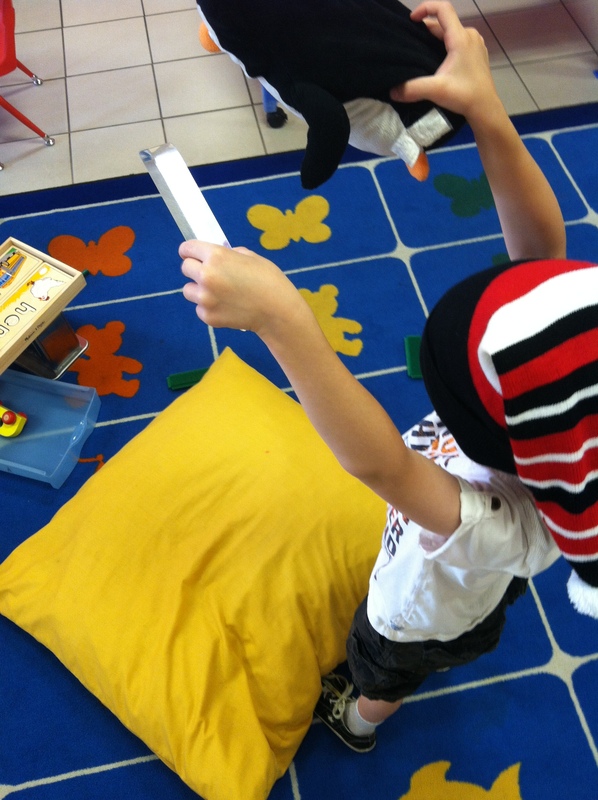 Do children learn to read faster with iPads or without iPads? Do carrots help people see better? Which kinds of baseball bats hit more home runs: metal bats or wooden bats? 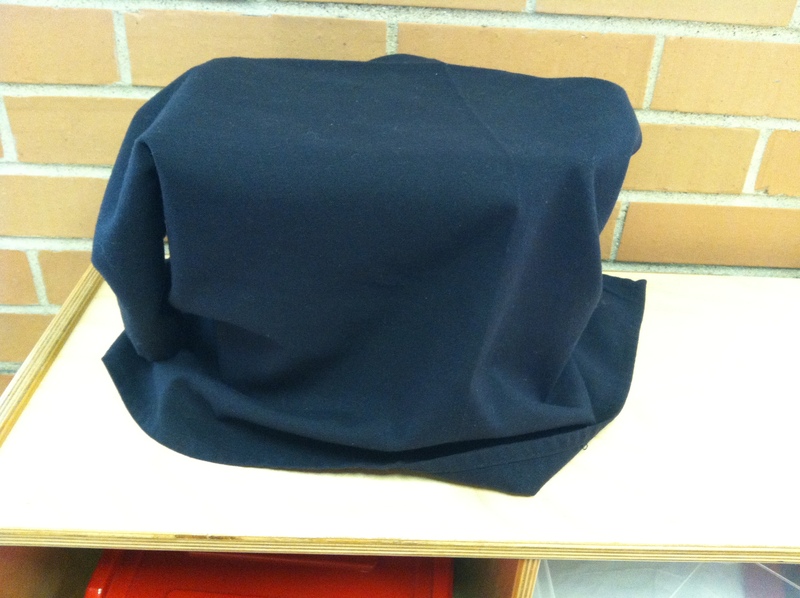 After we have designed a few imaginary experiments together, each day we carry out a real experiment in the classroom. Thinking of the best experiments is a challenge. Many science “experiments” that you find in books or on the web would be more accurately described as demos, as they don’t actually involve any experimental manipulation. They also often rely on abstract, handed-down knowledge (e.g., air pressure, electricity). Such knowledge can be fascinating, but teaching it often fails to address the process by which the knowledge was accumulated. So, I try to keep things relatively simple. 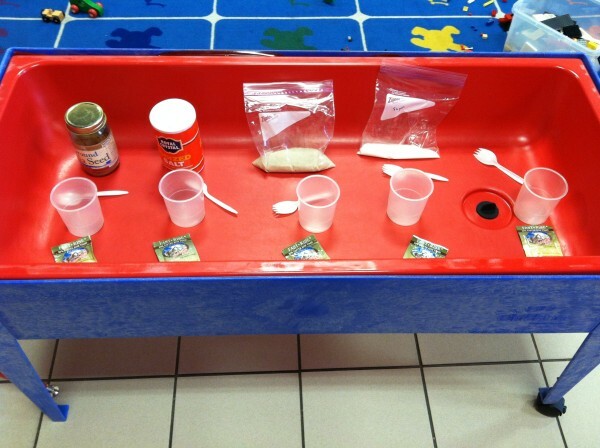 Another goal is to use experiments that show their results rapidly, so that children can draw connections between what they were thinking before the experiment and how the experiment helped them learn more. Below are a few examples of experiments we ran together this summer. Which objects are more slippery? 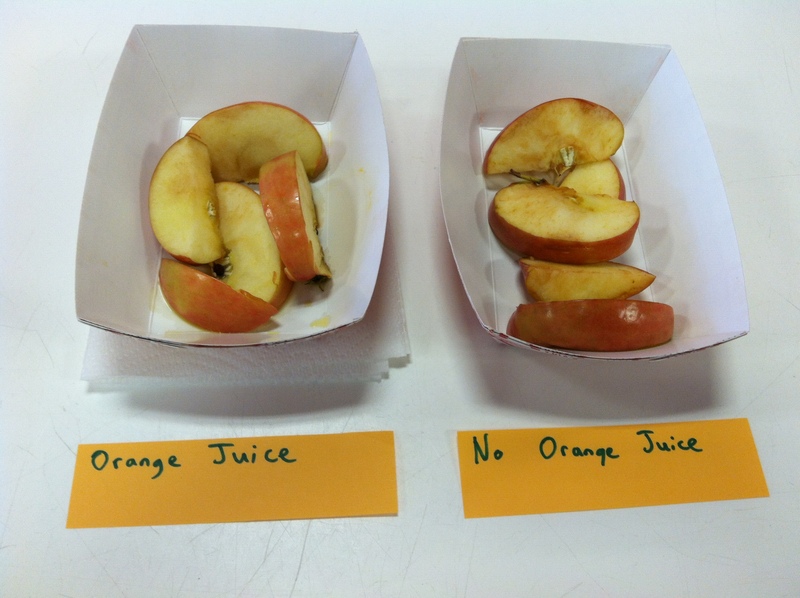 Will orange juice keep apples from turning brown? Do heavy things or light things fall faster? What will make the yeast bubble most? 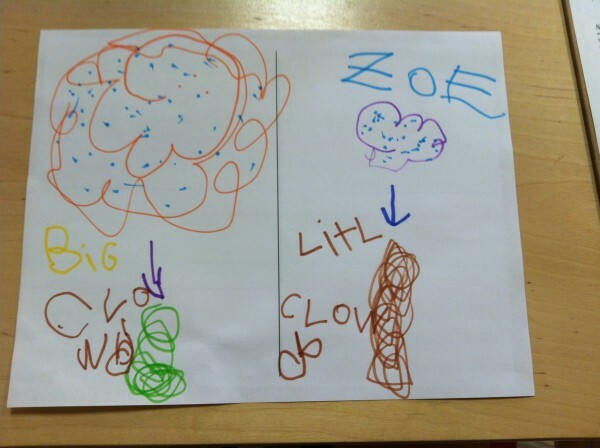 Do big or little clouds make tornadoes? Which kind of truck is going to break down first? 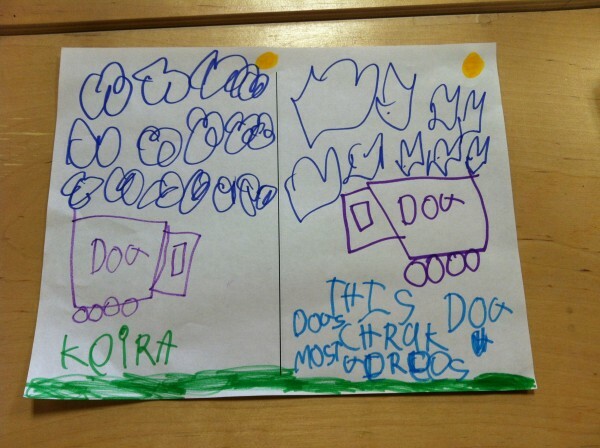 Which kind of dog truck can hold more dogs? Teaching the scientific method to young students is a pretty big challenge. I’ve chosen to simplify many things and there are aspects of science that my lessons do not address. Other educators certainly have different approaches, perhaps with equal or greater success. 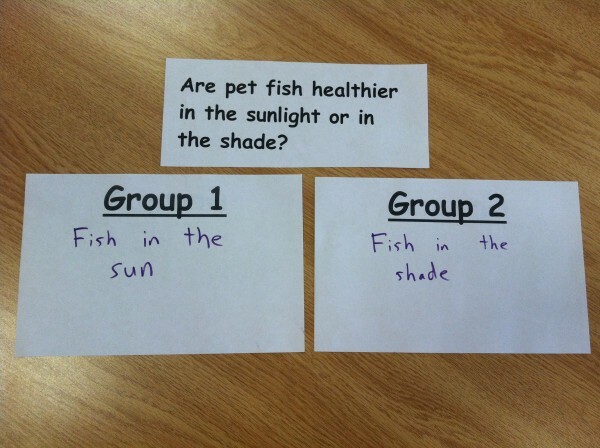 I do not expect young students to reach a very deep understanding of how science works. After two weeks of imaginary and real experiments, only a handful of my students are able to turn around and competently teach the scientific method back to me. It’s difficult to assess how well the rest of the class grasps the concepts. But I’ve seen that young children can at least begin to think about the world around them scientifically. And I believe that if they do so, then they and everyone else will benefit profoundly. I recently contributed an article to Neighborhood Parents Network‘s Parent to Parent Newsletter (pdf), which describes much of my approach to science education. Below is a slightly longer version of the piece. I hope you find it useful. In many ways, children are born scientists. Their natural curiosity drives them to explore and experiment, and they are often fascinated as they learn how the world around us works. Their thirst for scientific knowledge seems endless. But when you ask children what scientists do and how scientists come upon new knowledge, the response is often vague. You hear descriptions of men and women who know lots of things, dress in white lab coats and toy with beakers full of chemicals. Facts are often at the core of science education for young children, and that is part of a strong foundation in science. But science goes far beyond factual knowledge. The process by which scientists make their discoveries is what makes the world of science so special. The following tips can help plant the seeds of scientific reasoning in your child’s mind. Say, “I don’t know.” In fact I encourage you to sometimes say, “I’m not sure,” even when you do have a pretty good idea how something works. 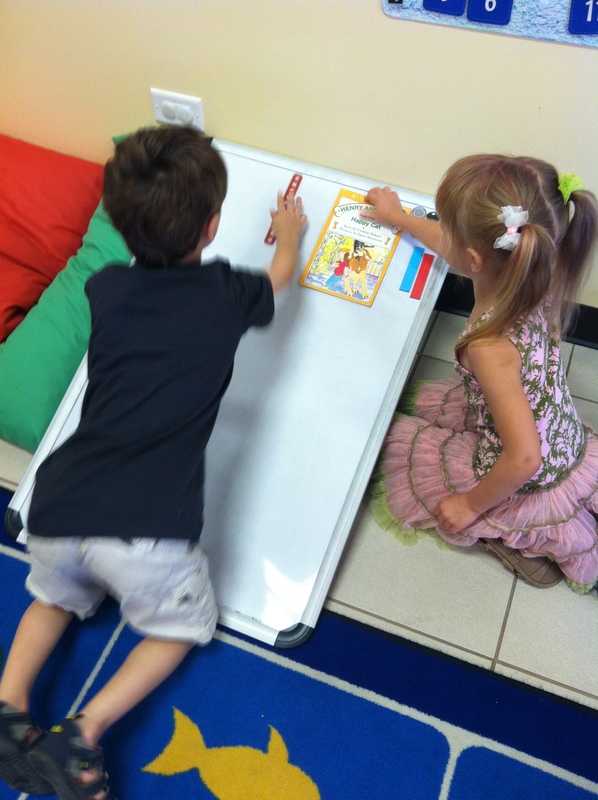 Then, with your child as a partner, follow up and try to find some answers. Young children are somewhat inclined to think dichotomously — either they know the answer or they don’t. Show your children that learning is an active process. Show them that “I don’t know” can be a temporary condition. Model different ways to search for knowledge. Read books, watch short videos, search the internet, and design your own experiments. Don’t stop with facts. Teach your child that penguins eat krill, and then tell them how you learned it. Maybe you read about it in a book that was written by a penguin scientist, who watches penguins. Maybe you saw a video or a photograph. Use the words “I agree” and “I disagree” as much as you can. These words are your friends. Whereas ‘yes’ and ‘no’ are stubborn declarations, talking about what you believe opens up a conversation. 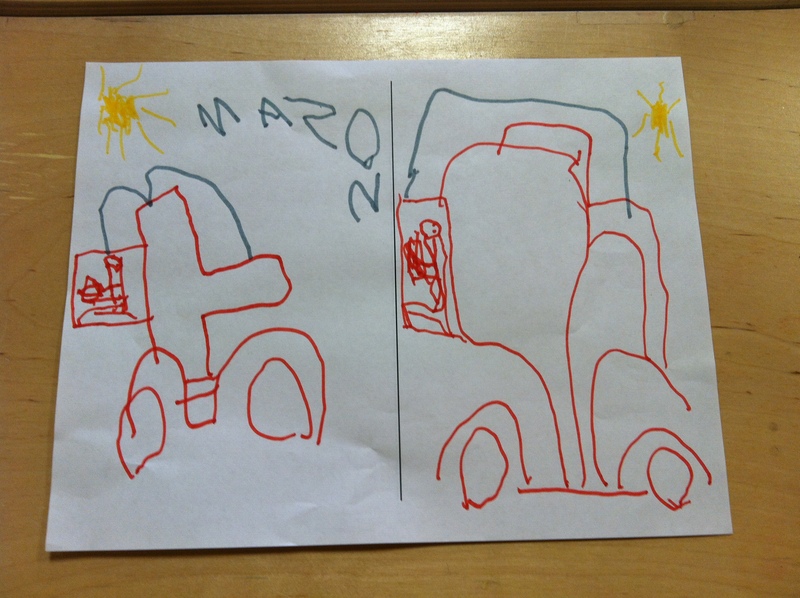 You can make a case for what you think, and children will get a glimpse of your thought processes. You can also teach that scientists often disagree; they do experiments to see who is right, and they sometimes change their minds. Question what your child already knows. If your child tells you that Tyrannosaurus ate meat, you’ll probably agree. But you don’t have to stop there. Dig deeper and ask your child why we think tyrannosaurus was a meat eater. Turn it into a research project. Ask whether people have ever seen a dinosaur eating. Then look at animals alive today, watch what they eat, look at their teeth, categorize them, and see what you’ve learned about sharp teeth. Discuss and implement simple experiments. I suggest starting with very simple experiments. Take something, put it into two groups, do different things to those groups, and then see what happens. With support, even very young students can see how the scientific method helps us learn. 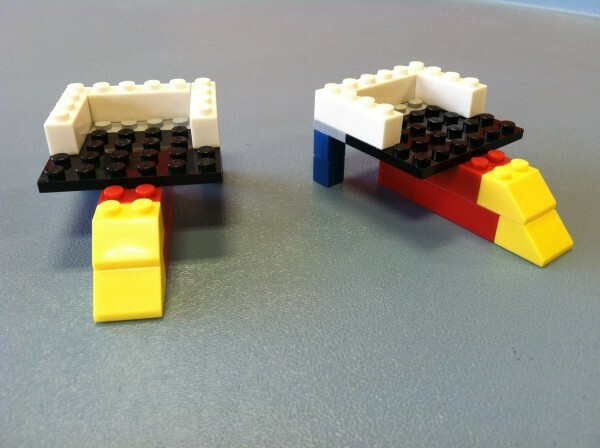 Does your child want to design an unrealistically challenging experiment? Does your experiment involve dozens of sharks and giant lasers? Well, then use your imaginations. Turn it into an art project and draw what might happen, or act it out with whatever costumes you can come up with. What do plants need to grow? Perhaps your child can tell you that they need dirt, water, air, and sunlight. This wonderful experiment shows how experimentation helps us learn more about what a plant needs. Plant bean seeds in four different cups, mugs, or small pots. Garden beans or green beans work best. You might want to plant two or three seeds in each container, because there could be some duds. Give each cup a different set of conditions. (1) One cup will get no dirt. (2) One cup will get no water. (3) One cup will get no sunlight. Either put a box over the top of it or keep it in a very dark closet. 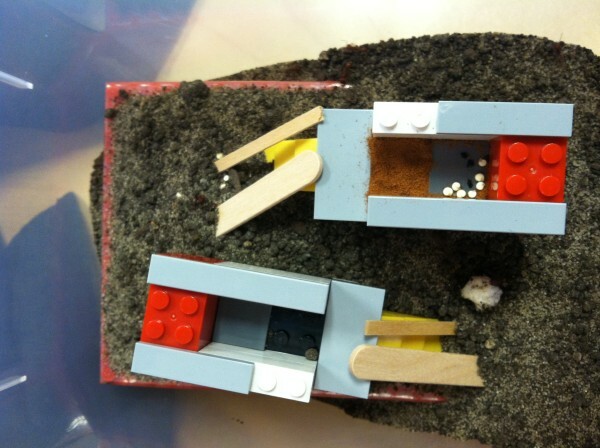 (4) And the last cup gets everything we think it needs: dirt, water, and sunlight. Then, water the plants every couple of days (but not the no-water plant!) and watch what happens. Plants will start sprouting after about a week. If you like, you can measure and graph their growth. Be prepared for a surprise!